Coffee is a drink that is brewed and has a distinct aroma and flavour and is prepared from roasted coffee beans.Coffee is one of the most popular drinks in the world andover 70 countries cultivate coffee beans. Coffee beans are selected, processed, and dried. Unroasted coffee beans are one of the most traded agricultural supplies in the world. Before being ground and brewed to make coffee, the beans are roasted to particular degrees depending on the particularflavour.To some extent coffee is acidic and can have a stimulating effect on individuals because of its caffeine content. 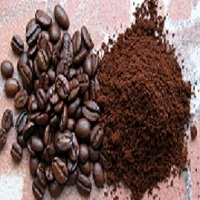 Coffee is most commonly adulterated with powdered tamarind seeds. If coffee is adulterated with powdered tamarind seeds then will sink to the bottom but if it is pure then it will float on the water.